The speak your mind Magazine is a new concept for the therapeutic development of people with mental health issues and in the relationships between these people; their carers and friends. The magazine mirrors the call, in the government; ‘A vision for change’ for the involvement of service users in the evolution of the system which provides their care. 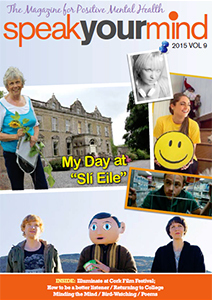 The genesis of the Magazine was the decision in the summer of 2008, of a number of residents of Glenmalure House on the Blackrock Road in Cork City, to publish a magazine as a way of giving themselves – and their peers in other mental health centres around the city – a voice. No limits were put on the range of topics to be considered. Glenmalure House is home to eighteen people who have been through the mental health system. The magazine was also conceived as a means of expanding and consolidating their community. Service providers and friends were invited to contribute to the magazine and the result was the first edition; which was launched on 11th September, 2008 by Cllr John Buttimer, Deputy Lord Mayor of Cork.